Rich but delicate, traditional British Fish Pie is the ultimate comfort food anytime of the year. These mini fish pies with scallops and king prawns are my favorite among traditional British pies, they make the perfect comfort food for chilled Spring evenings or Easter celebrations. 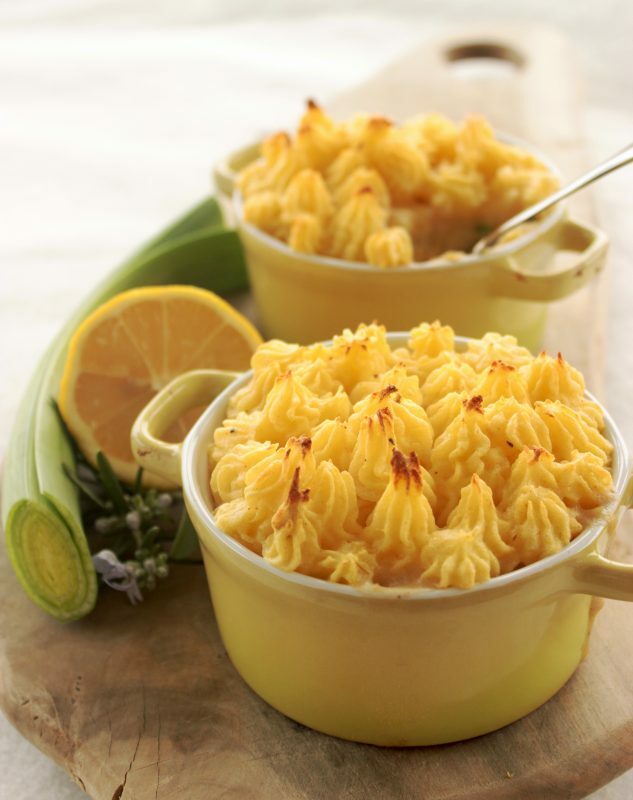 The original Fish pie recipe calls for a mix of cheap, easy to find fish such as cod, salmon, haddock, to name a few, but feel free to use the fish you like! I’ve given my fish pie a luxury touch by adding scallops and king prawns. I love everything about it, from the flavor combination to the texture, and it’s also loaded with fresh fragrant green veggies, making it a fantastic and complete meal for anytime of the year. I’ve quickly seared the scallops and king prawns in a screaming hot pan, to give them a nice smoky flavor. All the veggies are then freshly tossed together with the scallops and king prawns, and finally mixed with a few tablespoons of Crème fraîche ( sour cream). The cream is totally optional, so if you have allergies you can skip it altogether and make it 100% dairy free. In the original recipe, the fish and veggies are mixed with a heavy creamy fish sauce, which is not very low in fat and calories. So I prefer to use light crème fraîche, or not use any cream at all and just add vegetable stock. 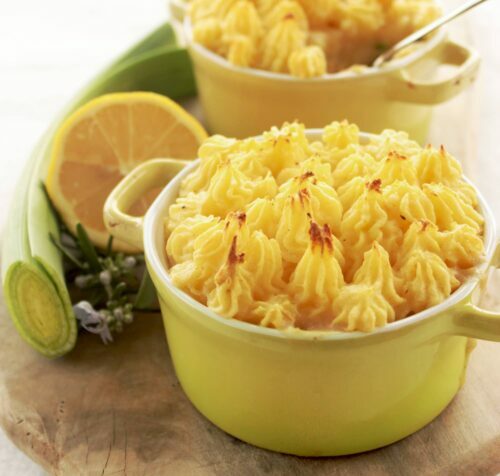 I recommend you use floury potatoes to make the fish pie topping, like Maris Piper potatoes. To make the mash, you can either mix the potatoes with butter and milk, or use Extravirgin Olive oil. I’m a big fan of EVOO, which is healthier than butter and gives a creamy but light texture to the mash. These Mini fish pies with scallops and king prawns are a fantastic appetizer to serve at parties and they’re super easy to make and completely mess-free. If you prefer, you can make one large pie instead and serve as a main course. However you choose to serve it, this is a must-try recipe that promises to be a showstopper at your next event! 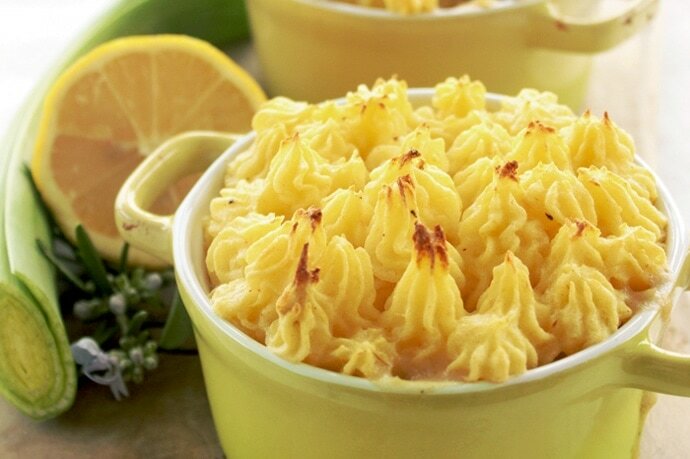 I really hope you give these awesome British fish pie a try. If you do, make sure to comment here below or on my facebook/twitter and let me know how you liked them. Don’t forget to snap a picture, tag it #thepetitecook and share it with me on Instagram! Looking at your pictures always makes my day! These mini fish pies with scallops an king prawns are my favorite among traditional British pies, they make the perfect comfort food for chilled Spring evenings. Heat oven to 360F/180C. Boil the potatoes for 20 mins. Drain, season and mash with the olive oil until creamy and soft, add more oil if necessary. Heat a large frying pan until screaming hot, and quickly sear scallops and king prawns for about 10 seconds on each side. Transfer the seafood in a large bowl, and add the white fish. Add in all the vegetables, juice and zest of a lemon, thyme and parsley. Season with salt and pepper to taste and drizzle with oil. Mix all the ingredients well, and pour the creme fraiche in (optional) and stock. Divide the mixture among mini individual casserole pots or a large pie oven-proof dish. Spread the potato mash evenly over the top of the fish and veg. Place in the oven for around 10 minutes, or until cooked through, crispy and golden on top. If you fancy the meat version, jump to the Shepherd’s Pie recipe. Oh, you should definitely give it a try :)! You won’t be disappointed I promise!